I just bought and used the coconut shampoo and it was great. Also got the curl smoothie, used it on my twists today, great. I haven't found the milk yet, thinking about getting the hold spray. I had the restorative conditioner first, it didn't do anything for me so I switched it out for the smoothie, based on that, Ithink I'm sticking to the coconut hibiscus line. Oooh and the walgreens I went to had the value packs for all the shea moisture lines: in smaller sizes but for 20 bucks, not bad! 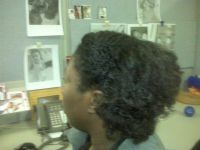 I have used the coconut shampoo, restorative condish, curl and style milk, hold +moisture spray, and loved them all. The jury is still out on the deep treatment masque. Did NOT like the smoothie. I just bought a moisture thickening milk from the Yucca line (black label) and it is very good, but be careful with the glycerin in it! At first I thought it was the same as the curl + style milk, but the ingredients are different: for example, the black one contains pantenol, glycerin, and a vitamin B. Bought that yesterday, but the Yucca line has the green label. African Blk Soap is the black. I saw the glycerin in it and didn't open it yet because of that, wondering if I should return it since summer is coming up and get the curl milk instead. a humectant. taking moisture... wherever they can find it. DUN DUN DUNNNN. if it's nice and (not too) humid and dew points are moderate-high, humectants draw moisture out of the air and put it into your hair, keeping your hair nice and moisturized. spring is the best time of the year for humectants unless your area is having a dry spell! but! if the air outside is dry and dew points are low, the humectant will draw moisture out of your hair because it has more moisture than the drier air. so your hair will be very dry. winter is the worst time for humectants since the air is usually very dry and cold. i like to think of humectants as little robin hoods.. stealing from the rich (moisture-laden) and giving to the poor (thirsty)! I didn't care for the Smoothie because of the smell and I felt it left my hair a little to coated and I wasn't impressed with the results..but it could have been that I just used to much. I may give it another try and apply a lot less of it. I love the Curl & Style Milk though. The smell is not as potent as the Smoothie. It is extremely moisturizing IMO and works well under a gel or alone for me. Works great for a wash n go to me. I decided to try the Shea Moisture Retention Shampoo and boy was I pleasantly surprised. My hair and scalp got nice and clean but my hair didn't feel super stripped afterwards. Given, I'm not a person that minds the stripped feeling shampoo gives since I keep my hair super conditioned all the time.. but this is great for people that do mind IMO. The Coconut & Hibiscus Hold & Shine Moisture Mist is great for refreshing my curls but I don't see all what shine it gives. I don't mind the lack of shine though since I do other things to give my hair a nice gloss. Now the Deep Moisture Masque..wow. This really impressed me the most. It works so great with heat IMO for a deep conditioning. I've even tried it as a leave in and good grief..my hair was super extra moisturized. I'm usually a daily wash n go'er and I experimented with this product and didn't wash my hair for 3 days. At the end of 3 days my hair was STILL moisturized. I'll always be a daily wash n go'er but I like that if I can't for some reason my hair retains moisture really well with this stuff. So if I HAD to go without washing..it would work nicely. I also love just slapping some of this stuff on damp hair for a pony tail! I don't usually wear my hair up but because of this stuff I've started doing more updos for fun. I like it because the hair is soft and fluffy so the updo or ponytail doesn't look all stiff or feel stiff either. Just feels silky! Great alternative to gel for updos for me. I did find though that using too much of the Masque as a leave-in much can leave my hair greasy, so if I use it as a leave-in then I apply to damp hair sparingly. I won't be using it often as a leave-in but it will continue to be a DT for me from now on. So I'm definitely pro Shea Moisture now! Thank you for clearing that up I had no idea I'm learning something new for my hair everyday ty! ^^ That African Black Soap Elixir is the truth! ok so even though the original sheamoisture leave in conditioner has been the truth for me for years, NONE of the new products have wowed me and Ive tried them all. The only one that raised a buzz was the new Curling Souffle and only because I can use it as a leave in and not a true gel. Today I finally picked up the purification mask after giving in. I used the other masks in the line as a prepoo and Im probably going to use this as one too. How do you guys use the purification mask, typical deep treatment? That's how I use it. I tried it after reading about it here (not impressed on freshly shampooed hair) and it totally changed my outlook. It melted the tangles out of my hair and left it sooo soft. I think I am going to use it tomorrow morning. I think it all depends on the individual. I haven't used the black label but the DC's in the SM line for me work well as leave-ins and even better as DC's. I don't pre-poo so I wouldn't know if it works like that. My bf used the African black soap shampoo and conditioner since I always rave about SM for his dry and itchy scalp and LOVES it. Why is the Yucca line for thin hair the ONLY Shea Moisture label that smells like <insert expletive here>? I love the Deep Treatment Masque. It's my fave leave-in conditioner. It leaves my hair soft, sheen-y and well-moisturized for days (I shampoo every 5-7 days and only moisturize weekly). I also use the Moisture Retention Shampoo. It's quite nice for a shampoo--It's doesn't strip and is slighlty moisturizing. The African Black Soap Shampoo is nice--just make sure you focus on the scalp as it can be drying. I have the Moisture Retention shampoo, conditioner, and Masque and also the Smoothie. I love them all! The Smoothie provides excellent moisture, and I use the masque also as a leave in which its awesome for also. The shampoo and conditioner is also great. I use to conditioner with some coconut oil to detangle my hair 3c/4a hair. It was probably mentioned before me, but I'm kinda lazy lol but the Smoothie has protein in it and if you're protein sensitive it can be very drying. I'm protein sensitive but the protein in it is fine for me. I get better hold and moisture from that than most products. I guess it also depends on your hair. I've tried most of the products from each of the lines. I don't have scalp issues, so the ABS line was just O.K. for me. I use the purification mask (combined with some other conditioner) to pre-poo/detangle. The shampoo is the only product I liked in the organic raw shea line. I use the DTM the same way as the purification mask. I like the coconut and hibiscus line...wasn't too impressed with the shampoo. I use the smoothie as a leave-in and as a moisturizer on dry hair. I use the milk to twist or refresh WnGs. The yucca line is my favorite, since it provides moisture and strength. My hair reponds well (absorbs) all the products, and I have no issues with the smell. I use the anti-breakage mask the same way as the smoothie...haven't tried it as a DC yet, cuz I'm lazy and the other masks have been a miss. I will repurchase this line. If I stumble across the souffle, I'm buying it. I tried the curl and style milk recently. My hair was defined but dry. I realized this product glycerin free and my hair likes glycerin. I used the smoothie & hair loves it. I would use the curl &style milk as leave in. Its a good product!